Old-fashioned builders relevel concrete slabs using two main techniques. One is called mud jacking. Builders pump a concrete slurry underneath your concrete slabs to fill the voids beneath. But this adds weight and increases the possibility of further sinking later. The second technique is to simply tear out old concrete slabs and replace them. Both these techniques are obsolete, cost a lot of money and eat up a ton of your time. Neither technique is reliable — which is why we don’t use them. Instead, our team of fully licensed technicians and highly qualified structural engineers use modern, progressive techniques. By using GeoPoly™, our proprietary geo-polymer injection technology, we raise sinking concrete quickly at a price you can afford. The best part? Our concrete levelling solution is permanent. This concrete leveling solution addresses sinking concrete slabs inside buildings, most likely the floors of your home, workspace or garage. To begin this process, we drill 1 cm access holes through your concrete until we reach the underside. We can drill up to 2 m beneath the concrete. Afterwards, we insert temporary ports into each hole. 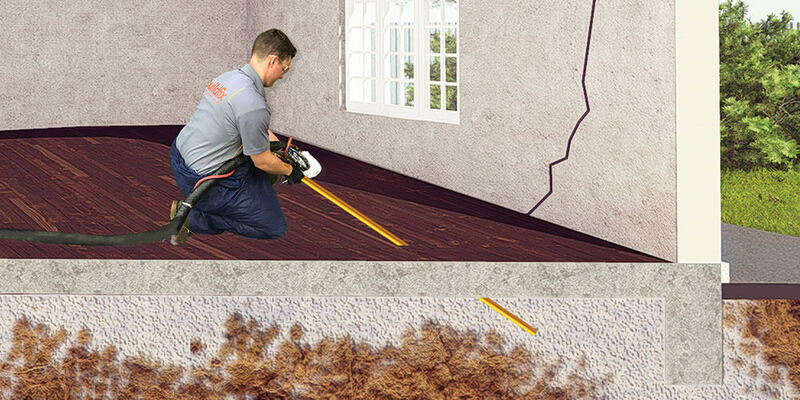 Using a high pressure of 2500 psi, we inject GeoPoly™ to fill voids under your concrete, raise the concrete and/or stabilise the soil. Most concrete slabs can be lifted up to 50 mm and if ground conditions are in your favour, we can achieve even more of a lift. To make sure your concrete is evenly leveled, we monitor the entire process with laser levelling equipment. To complete this concrete leveling process, we remove all the ports and fill the access holes to leave your concrete looking as if untouched. 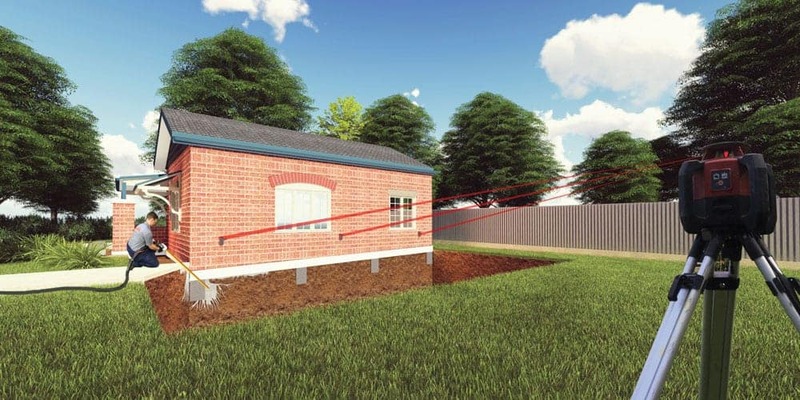 This concrete leveling solution addresses sinking concrete slabs outside your home. This can include your driveway, stairway, patio, slabs in your garden, pool area and much more. The process is effectively the same as the internal one. We drill 1 cm access holes through your concrete until we reach the underside. Inserting temporary ports into each hole, we use a high pressure of 2500 psi to inject GeoPoly™ underneath the concrete. Afterwards, we remove the ports and fill the access holes. Need a concrete leveling solution now? If your concrete is sinking internally, externally or even both to create trip hazards and a total eyesore, we’re here to help. We begin all of our jobs with a FREE inspection.